The Rocky Horror Show press call at the Randolph Hotel, Oxford. 22/9/16. Pictures Stuart Harrison Photography. 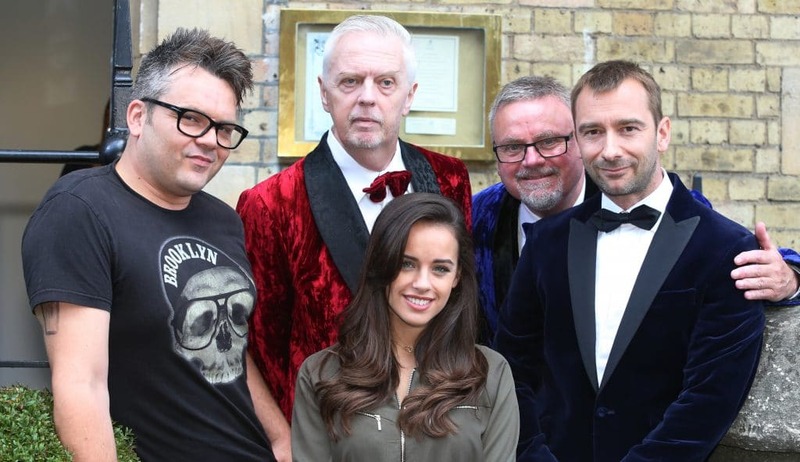 T he cast of The Rocky Horror Show weren’t over at the Frankenstein Place on 22nd September – they were at the Randolph Hotel to promote their Christmas run in Oxford! Actress and model Georgia May Foote (who plays Columbia) and S Club 7’s Paul Cattermole (who plays Eddie/Dr Scott) were joined by three of the four famous faces confirmed to play the role of The Narrator at the New Theatre from 13th-31st December were in town to launch the Rocky Horror Show’s Oxford run. Comedian Norman Pace will be taking to the stage, as will actors Charlie Condou, who played Marcus Dent in Coronation Street, and Philip Franks, best known for his roles in The Darling Buds Of May and Heartbeat. Completing the all-star narrator line-up is Steve Punt, one half of Punt and Dennis, who is currently narrating the show in Eastbourne. Guests were treated to a sneak peek of the show and had the chance to ask questions of the talented cast, before mingling with them over cocktails and canapés. Georgia, who is looking forward to spending Christmas in the city, said: “I love Columbia, she’s a little bit crazy. I can’t wait to play her. “I’m really excited about joining the cast, they are such a well-oiled machine and work so well together. I can’t wait to work with Charlie again either. When I was on Coronation Street, we got on really well so it’s lovely to see him again. Comedian Norman, who is best known as one half of Hale and Pace, said he loved performing in the show. “When I first did the show, I was offered the part because someone was poorly and so they came to me as they thought I had the necessary skill set to handle it. So I got the gig and I’m still here. Norman, who was last at the New Theatre in Annie Get Your Gun in 2014, said it was wonderful to be returning. And Philip Franks, who attend the University Of Oxford, said he defied anybody to watch the show and not enjoy it. “I saw the show with Tim Curry when I was a school and it is one of my treasured memories of the 1970s. Directed by Christopher Luscombe, the Rocky Horror Show is a guaranteed party, which famously combines science-fiction, horror, comedy and music. Audience participation is encouraged, meaning of course, getting dressed in your most outrageous fancy dress. This musical extravaganza features all of its famous musical classics including “Science Fiction/Double Feature”, “Dammit Janet” and of course, the timeless floor-filler, “The Time-Warp”. Ready to thrill you with fun and naughty moments, O’Brien’s Rocky Horror Show is the boldest bash of them all. Be warned, this show has rude parts! Tickets can be purchased from the New Theatre box office on George Street, by ringing 0844 871 3020 or by visiting the website (phone and internet bookings subject to booking/transaction fee. Calls are charged at 7p per minute, plus your phone company’s access charge.). For bookings of 10 or more, or for Equal Access bookings, please call the dedicated in-house team on 0844 871 3040.